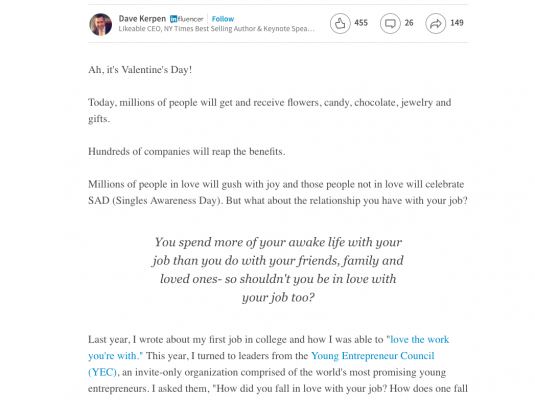 Justin Lefkovitch Speaks with Linkedin on Falling in Love…With Your Job? Falling in Love…With Your Job? Today, millions of people will get and receive flowers, candy, chocolate, jewelry and gifts. Hundreds of companies will reap the benefits. Millions of people in love will gush with joy and those people not in love will celebrate SAD (Singles Awareness Day). But what about the relationship you have with your job? You spend more of your awake life with your job than you do with your friends, family and loved ones- so shouldn’t you be in love with your job too? These are the highlights they shared! Ultimately, I fell in love with this job because I made it my own. I conceived the idea, pooled the resources to make it happen, and ultimately have built something of which I’m incredibly proud. I’m passionate about the work we do, I’m proud of our accomplishments, and I’m proud of my team. Those three things make it really easy to love what I do, especially knowing that I built it how I wanted.